If you happen to be among the dwindling group of people that still has one of the most popular newspapers delivered to your door, you probably have plenty of them stored away somewhere. 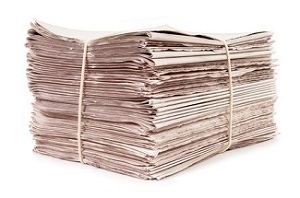 Old newspapers can quickly take up storage space or fill up your recycle bin. So here are some ideas for things you can use all those old newspapers for. Making papier-mache projects is a tradition for children who love getting messy with the strips of torn newspapers that are soaked in water before the items are placed on blown-up balloons. To keep the newspaper strips on the balloons, it is necessary to slather a mixture of flour and water on the project. After the project dries completely, an artist can paint the item with a plain color or designs. Animal designs such as rabbits or penguins are especially easy to create. After the paint of the design dries, use a sharp sewing pin to pop the balloon. Anyone who has a fireplace or enjoys camping can use a few fire starters made from newspapers to get a fire started quickly. This is a great way to save money with a homemade fire starter instead of store-bought ones. First, remove any color dye advertisements or comic pages from the newspaper because the inks on these create a chemical odor. Next, cut inexpensive twine or string into small sections. Place a thin stack of newspapers on a table and roll the stack as tightly as possible before tying it toward each end with a piece of string or twine. When shopping in a hobby store, look for clear Christmas ornaments that have a removable top. For this newspaper craft, only specific sections are used. For instance, crafty people can choose an article concerning a favorite sport’s team or a celebrity’s black-and-white picture to roll and place inside the clear ornament so that it is easier to see. Use a small paintbrush dipped in translucent glue to reach inside the top of the ornament to hold the newspaper sections in place. To hold the article or picture inside permanently, shred newspaper to put in the middle of the ornament. The prices of wrapping paper and gift bags are increasing, so save money by covering birthday gifts for children with comic strip pages to give everyone something to laugh about. With careful wrapping and taping, party goers will think this paper is brand-new. After all, children just rip off the paper and throw it in the trash anyway. For adults, use gift bags made with a special folding, cutting and gluing technique. It is even possible to use themed newspaper pages to wrap certain types of gifts, such as the fashion page to create a gift bag to hold a new shirt. Newspaper is a biodegradable material suitable for composting in a sturdy container that holds dirt. Avoid using newspaper pages with colored ink in a composting pile. Newspaper degrades slowly in large sections, so use a shredding machine to make tiny strips. After putting the strips of newspaper into a composting pile, remember to stir the dirt to aerate the soil. When the newspapers degrade completely, it creates rich soil that is useful for fertilizing a garden or enriching a worm farm. If you happen to have an old newspaper that you actually want to hang on to, you will want to make sure you store it properly. After all that newspaper is a historical record of what happened on that day. Maybe it was part of your five minutes of fame where you got to be featured in the local news. Whatever the reason, there are a few good ways to store your artifact properly. The first is to take a digital photo or scan of each page. That will probably take you awhile, so you might want to just find a glass box to store it in. A final option is to get a really good ziploc bag. Just remember, air is the enemy when it comes to paper.